Billabong USA is proud to announce the second annual “Billabong Art of Shaping Event” to be held September 10th-12th at the ASR Action Sports Retailer Trade Show in San Diego CA. This years’ “Billabong Art of Shaping: San Diego Edition” event will feature many of the top shapers from the rich board building heritage of San Diego county. The finalized list of invitees includes Bill Bahne, Tim Bessell, Chris Christenson, Carl Ekstrom, Rick Hamon, Gary Hanel, Mike Hynson, John Kies, Gary Linden, Steve Lis, Larry Mabile, Gary MacNabb, Bob Mitsven, Rich “Toby” Pavel, Steve Pendarvis, Jim Phillips, Rusty Preisendorfer, Robin Prodanovich, Steve Seebold, Donald Takayama, Hank Warner, Xanadu and Marcio Zouvi. San Diego County is famous for its talented crew of shapers that have introduced a significant number of design innovations and developments which have had a remarkable effect on the sport of surfing and the surfboard itself. It was Gerry Lopez himself that made this statement: “We couldn’t really ride the Pipeline properly until Michael Hynson introduced us to the downrailer”. Along with Hynson’s infamous downrailer design San Diego produced such innovations as the Stevie Lis Fish, the Ekstrom asymmetrical, the Rich Pavel Speedialer, the Donald Takayama Step Deck and other notable designs. The concept of the “Billabong Art of Shaping Event” is simple; it is a venue to showcase the talent of San Diego surfboard shapers and craftsmen by allowing them to build boards that highlight their particular contribution or influence on the evolution of the surfboard over a particular span in time. Shapers are invited and encouraged to “create a board representing the era, style, or shape they are best known for or relate to”; whatever best motivates their creativity and talent. The shapers entry is then placed on display at the ASR trade show along with full sized images of the shaper himself and a profile that includes information on the board he choose to build, his company or label, and his shaping history or career. The images featured at the show will be turned over to each individual shaper at the close of the event. Once an invited shaper accepts our invitation he will receive a check for $600 cash to be used towards materials. The shaper is then free to submit whatever type of board he deems appropriate; knowing he will be in competition with his peers to win bragging rights of winning the “Billabong Art of Shaping Event”, along with a check from Billabong for $2,000. The runner up will receive a free full page ad in SURFING Magazine’s “Board Builder’s Issue” featuring his boards and label. The winner of the competition is the shaper of the board that brings in the highest auction price and thus becomes the largest single donor to the Liquid Nation Ball charity; the charity chosen for the “Billabong Art of Shaping Event”. Our goal is to feature 25 boards from 25 different shapers in a display of 8 linear booths at ASR. Each board will be highlighted with a 3’ X 6’ banner with photos of each shaper; either shaping, surfing or in a combination of both. Additionally, there will be a written profile along with a portrait photo of each shaper on a bidding stand along the outside perimeter of the velvet roped display. During the course of the show guests are invited to view the boards, read the stories and place silent auction bids on any of the boards of their choice. The booth will be hosted by Royce Cansler and Eric “Bird” Huffman, who collectively have an extensive knowledge of San Diego shapers and their accomplishments. On Friday afternoon at 3:00 PM the boards will be relocated to an upstairs meeting room where they can be viewed and examined by potential buyers. Moving the boards upstairs to a meeting room off the show floor will allow invited guests from the public that have signed up and RSVP’d in advance for the evening auction to view the boards for the first time beginning at 4:00 PM. From 4:00 PM to 6:00 PM guests will be able to closely view each entry in preparation for the live auction that will begin promptly at 6:00 PM and finish before 8:00 PM. During the viewing period guests can enjoy pupu’s from Nalu’s Grille, Primo beer, Wild Rock wine, Sambazon smoothies and Smart water in an effort to prime the pump before the bidding begins. Royce Cansler and Bird will assist the auctioneer in moving through the boards quickly and efficiently once the live auction begins. The time frame involved will allow for the auctioneer and the guests planning on attending the Liquid Nation Ball adequate time to travel on to La Jolla. Guests making purchases that night will be allowed to take their purchases with them upon payment in full; or have the option of leaving their purchases behind after payment in full until the afternoon of the last day of the show. Those that choose to pick up their purchases on Saturday will find their boards returned to the display booth until the end of the show. The auction will benefit the SIMA Humanitarian Fund. 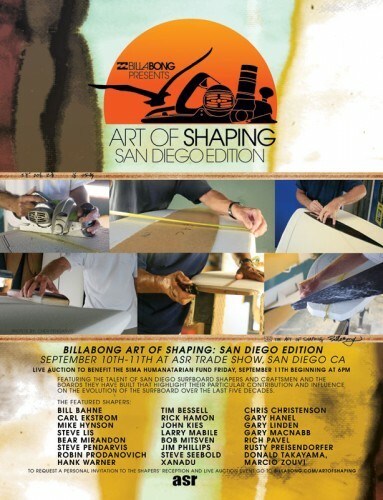 One Comment on "The Art of Shaping 2009 San Diego Edition"
site is up and running! !